High Drama at the Gates of Hormuz – US patrols against Somali and Iranian Pirates free the Iranians and brig the Somalis. Is this a Diplomatic Warning to the President of Iran? The freed Iranian fishermen and the Bahamian-flagged commercial ship praise the Americans that answered their prayers to the Gods. If the World stops buying Iranian oil will this somewhat decrease the needs for US policing the seas? Obama’s Americans call on Ahmedinejad’s bluff by saving his Iranian fishermen from the hold of Somali pirates – right there on Iran’s frontage or doorstep. ABOARD THE FISHING VESSEL AL MULAHI, in the Gulf of Oman — Senior Iranian military officials this week bluntly warned an American aircraft carrier that it would confront the “full force” of the Iranian military if it tried to re-enter the Persian Gulf. Are the American ships there to keep the oil-transport lanes open? Then if there will be no exports from Iran, there will be a diminished need for US chaperons against Somali pirates! The US will have to guard only the Iraqi, Kuwaiti, Saudi, UAE, Bahrain, Qatar, Oman, oil transports! Pirates were operating where vital shipping routes cross. Tyler Hicks/The New York Times – American sailors with captured Somali pirates near the mouth of the Gulf of Oman, after the pirates’ Iranian hostages were freed. In a naval action that mixed diplomacy, drama and Middle Eastern politics, the aircraft carrier John C. Stennis broke up a high-seas pirate attack on a cargo ship in the Gulf of Oman, then sailors from an American destroyer boarded the pirates’ mother ship and freed 13 Iranian hostages who had been held captive there for more than a month. The cocky senior Iranian military officials this week had warned bluntly an American aircraft carrier that it would confront the “full force” of the Iranian military if it tried to re-enter the Persian Gulf – and see now – Ahmedinejad had to rely on the US Navy to get his fishermen back safe from Somali pirates he seemingly loves so much. The rapidly unfolding events began Thursday morning when the pirates attacked a Bahamian-flagged ship, the motor vessel Sunshine, unaware that the Stennis was steaming less than eight miles away. It ended Friday with the tables fully turned. The captured Somali pirates, 15 in all, were brought aboard the U.S.S. Kidd, an American destroyer traveling with the Stennis. They were then shuttled by helicopter to the aircraft carrier and locked up in its brig. This fishing vessel and its crew, provided fuel and food by the Navy, then set sail for its home port of Chah Bahar, Iran. 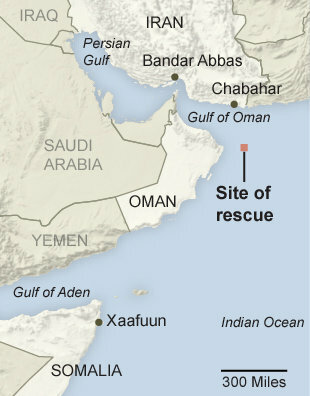 The rescue, 210 miles off the coast of Iran, occurred against a tense political backdrop. On Tuesday the Iranian defense minister and a brigadier general threatened the Stennis with attack if it sought to return to the Persian Gulf, which it had left roughly a week before. The warning set up fears of a confrontation over the vital oil shipping lanes of the Strait of Hormuz. None of that tension was evident at sea. The Sunshine, a 583-foot cargo ship carrying bulk cargo from Calais, France, to Bandar Abbas, Iran, continued its journey. The freed hostages, Iranian citizens, greeted the American sailors with wide-eyed relief. Mahmed Younes, 28, the fishing vessel’s captain, said he and his crew had been captured roughly 45 days ago by pirates in a skiff, who boarded their 82-foot dhow and forced it to an anchorage in the northern Somali port of Xaafuun. There, the pirates took on provisions and more gunmen. In late December the pirates, using their hostages to run the dhow, set back out to sea, hunting for a tanker or large cargo ship to capture and hold for ransom. For several days, Al Mulahi roamed the Gulf of Oman, unmolested under its Iranian flag, the pirates and former hostages said. They saw several ships. But the pirates’ leader, Bashir Bhotan, 32, did not think any of them would command a high ransom. They let them pass. On Thursday morning, six of the pirates set out in a fiberglass skiff and found their quarry — the Sunshine, 100 miles from the shore of Oman. One of the pirates, Mohammed Mahmoud, 33, later said this was the type of vessel they would hope might fetch a ransom of several million dollars. Brandishing a rocket-propelled grenade and several Kalashnikov rifles, they rushed alongside, threw a grappling hook and tried to lash a ladder to the Sunshine’s side. They hoped to scale the gunwales and seize the bridge. Their plans unraveled immediately. As the Sunshine radioed for help, and tried to deter the boarding by spraying the pirates with fire hoses, the pirates were unable to board. “Our ladder broke,” Mr. Mahmoud said. Then an American helicopter appeared. Neither the pirates nor the crew of the Sunshine had known it, but three Navy ships — the Stennis; the U.S.N.S. Rainier, a supply ship; and the U.S.S. Mobile Bay, a guided-missile cruiser — were steaming in formation a few miles away. The carrier was taking on provisions from the Rainier and had several helicopters in the air when the Sunshine radioed its distress call. Aboard the carrier, Rear Adm. Craig S. Faller, who commands the carrier strike group, looked at the chart and radar images of the Sunshine’s location with something like disbelief. The Sunshine and the Stennis were only a few miles apart. “These might be the dumbest pirates ever,” he said. HONG KONG — Under growing pressure from the United States, some of Asia’s largest economies are reluctantly looking for options to reduce the amount of oil they buy from Iran, a move that would further tighten the economic vise on an increasingly defiant nation that announced plans for a new round of naval drills in the Strait of Hormuz. The decision by South Korea and Japan to try to accommodate Washington’s demands follows reports that China has already reduced its purchase of Iranian crude in the past month in a pricing dispute with Tehran. Whatever the motives, the combined loss of sales threatens an economy already reeling, where the currency has plummeted in value, inflation has surged and the general public has expressed growing anxiety about the prospect of war. China, Japan, India and South Korea together import more than 60 percent of Iranian oil exports, and they all depend on Iran and other Persian Gulf producers for the preponderance of their oil and natural gas needs. As tensions in the gulf have escalated and alarmed Asian governments and businesses, companies and traders from those countries have been putting out feelers to places like Russia, Vietnam, West Africa, Iraq and especially Saudi Arabia to export more oil to them, according to oil experts. For Tehran, which relies heavily on oil revenues to prop up an economy battered by years of sanctions, the potential cutbacks by its Asian customers follow a decision by theEuropean Union to move toward a ban on the import of Iranian oil. Taken together, the Western efforts represent the most serious economic pressure yet on Iran after years of conflict over a nuclear program that the West charges is aimed at building weapons. But if the goal is to force Iran to relent, the campaign has so far had an opposite effect: Iranian officials have equated targeting their oil market with economic war andthreatened to block the Strait of Hormuz, where about one-fifth of the world’s oil passes to get to market. The United States, however, is keeping the pressure on. Treasury Secretary Timothy F. Geithner is scheduled to visit Beijing and Tokyo next week, and the tightening sanctions on Iran will be high on his agenda. United States officials said that Mr. Geithner will press China at least to resist importing more Iranian oil to replace exports that would otherwise go to Europe. The trip is part of a concerted effort by Western diplomats to persuade Asian countries to go along with new European sanctions, American and European officials say. The Asian efforts to wean themselves from Iranian crude are in response to legislation enacted by Congress at the end of last year requiring the administration to phase in sanctions in stages by late June that would make it very difficult for others to buy Iranian oil, by barring transactions with Iran’s central bank. The sanctions exempt food, medicine and other humanitarian trade and include a presidential waiver for any country or company in cases in which the impact would harm the national security interests of the United States. More significantly, the legislation exempts from sanctions countries that “significantly reduce” imports from Iran. The legislation does not define this term, leaving it to the administration, according to officials. The debate over the definition, now under way, has given the administration some leverage to entice allies like Japan, South Korea and even China to make some reductions, thus intensifying pressure, without having to take the hit of cutting off imports all at once. But Japan and South Korea have expressed some alarm at the demand that they reduce their reliance on Iranian oil, fearing that such a move could undermine their economies. Japan, the second-largest buyer of Iranian oil, depends on Persian Gulf countries for four-fifths of its oil imports, which come through the Strait of Hormuz. Osamu Fujimura, the chief cabinet secretary, announced on Friday that Japan had expressed concern to the United States about the dangers to the Japanese and global economy from limits on Iran’s oil exports. Yasushi Kimura, the president of the JX Nippon Oil and Energy Corporation, Japan’s largest refiner, announced on Thursday that his company had opened talks with Saudi Arabia and others, whom he did not name, about possible alternatives. The South Korean government announced on Thursday that it was looking for ways to limit its imports of oil and oil products from Iran, but pointedly stopped short of suggesting that it could stop these imports altogether. 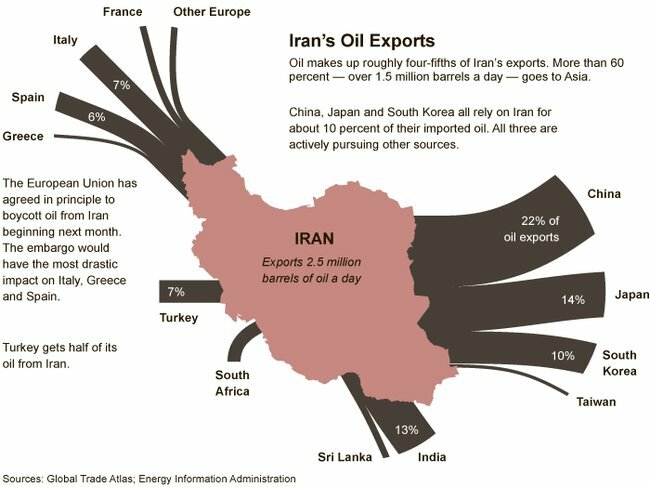 China, which imports about 11 percent of its oil from Iran, has actually reduced its daily purchases of Iranian crude, although estimates of the cutback range from as little as 15,000 barrels a day, or 3 percent of Chinese imports from Iran, to considerably more than that. It was hard to know if Beijing was making a political statement or merely trying to buy the oil on better terms. Saudi Arabia has repeatedly said it would increase production if needed to make up for any decline in exports from Iran, its longtime regional rival. “Saudi Arabia and OPEC have always delivered what the market required,” said Sadad Ibrahim Al-Husseini, former head of exploration and production at Saudi Aramco, the Saudi state oil company. “There is enough supply from other OPEC countries” to compensate for losses of Iranian supplies, he added. Mr. Husseini stressed that Middle Eastern oil markets were not yet in crisis mode, noting that insurance rates on tankers had not yet gone up in part because a tightening of European sanctions is at least a month away and a blockade of the strait is considered unlikely. “The market is still comfortable Iran cannot pull off its threats,” he said. But oil analysts have warned that the international oil market remains tight, even with Libyan oil quickly coming back on line. Any disruption in the Middle East would probably bring a sharp increase in prices, which would put the shaky world economic recovery at risk, they say. The Chinese Foreign Ministry took a cautious position this week on Iran, reiterating China’s broad objection to all sanctions that have not been approved by the United Nations and expressing hope that no military action of any sort will take place. “We hope to maintain peace and stability in the gulf region,” said Hong Lei, a Chinese Foreign Ministry spokesman, at a regularly scheduled news conference on Wednesday. But China is worried about the flow of oil through the Strait of Hormuz, said Patrick Ho, the chief executive and secretary general of the China Energy Fund Committee, an influential group in Hong Kong and Beijing with links to the Chinese government. “It is the lifeline as far as energy is concerned for China,” Mr. Ho said. Eight pilot countries in the Caribbean – Anguilla, Antigua and Barbuda, Barbados, Bermuda, the Cayman Islands, Dominica, Jamaica, and St. Lucia – have been studied for a Catastrophe Risk Insurance Facility, Enhancing the climate risk and adaptation fact base for the Caribbean. How does it reflect on Pakistan’s problems. subject Caribbean Economics of Climate Adaptation Study results released. Please see attached press release regarding the publication of preliminary results of the study on the Economics of Climate Adaptation (ECA) in the Caribbean implemented by the Caribbean Catastrophe Risk Insurance Facility and regional partners. The results for eight pilot countries (Anguilla, Antigua and Barbuda, Barbados, Bermuda, the Cayman Islands, Dominica, Jamaica, and St. Lucia) are presented in a short brochure entitled, Enhancing the climate risk and adaptation fact base for the Caribbean (Preliminary Results). An Explosion at the UN – the departing Swedish head of the UN Office of Internal Oversight Services (OIOS), in a 50 page memo, makes it clear that this UN Administration has failed to clean up the UN and actually actively insisted on making things worse – we observed this a couple of years ago. It is time to look for a Can-Do UN Secretary General as we have observed earlier this year. The article echoed in Vienna also. Much of the UN rebuttal is mush and we will report on how this unfolds. Departing U.N. official calls Ban’s leadership ‘deplorable’ in 50-page memo. UNITED NATIONS — The outgoing chief of a U.N. office charged with combating corruption at the United Nations has issued a stinging rebuke of Secretary General Ban Ki-moon, accusing him of undermining her efforts and leading the global institution into an era of decline, according to a confidential end-of-assignment report. The memo by Inga-Britt Ahlenius, a Swedish auditor who stepped down Friday as undersecretary general of the Office of Internal Oversight Services, represents an extraordinary personal attack on Ban from a senior U.N. official. The memo also marks a challenge to Ban’s studiously cultivated image as a champion of accountability. Shortly after taking office in 2007, Ban committed himself to restoring the United Nations’ reputation, which had been sullied by revelations of corruption in the agency’s oil-for-food program in Iraq. But Ahlenius says that, rather than being an advocate for accountability, Ban, along with his top advisers, has systematically sought to undercut the independence of her office, initially by trying to set up a competing investigations unit under his control and then by thwarting her efforts to hire her own staff. Ban’s top advisers said that Ahlenius’s memo constituted a deeply unbalanced account of their differences and that her criticism of Ban’s stewardship of the United Nations was patently unfair. “A look at his record shows that Secretary General Ban has provided genuine visionary leadership on important issues from climate change to development to women’s empowerment. He has promoted the cause of gender balance in general as well as within the organization. He has led from the front on important political issues from Gaza to Haiti to Sudan,” Ban’s chief of staff, Vijay Nambiar, wrote in a response. “It is regrettable to note,” Nambiar added, “that many pertinent facts were overlooked or misrepresented” in Ahlenius’s memo. The departure of Ahlenius, 72, coincides with a period of crisis in the United Nations’ internal investigations division. During the past two years, the world body has shed some of its top investigators. It has also failed to fill dozens of vacancies, including that of the chief of the investigations division in the Office of Internal Oversight Services. That post has been vacant since 2006, leaving a void in the United Nations’ ability to police itself, diplomats say. The U.N. General Assembly established the Office of Internal Oversight Services in 1994 to conduct management audits of the United Nations’ principal departments and to conduct investigations into corruption and misconduct. The founding resolution granted the office “operational independence” but placed it under the authority of the secretary general and made it dependent on the U.N. departments it policed for much of its funding and administrative support. The dispute between Ahlenius and Ban has underscored some of the resulting tensions and exposed a protracted and acrimonious struggle for power over the course of U.N. investigations. While Ahlenius cited Ban’s move to set up a new investigations unit as a sign that he was seeking to undermine her independence, Nambiar said that it was intended to strengthen the United Nations’ ability to fight corruption. Ahlenius also clashed with Ban over her efforts to hire a former federal prosecutor, Robert Appleton, who headed the U.N. Procurement Task Force, a temporary white-collar crime unit that carried out aggressive investigations into corruption in U.N. peacekeeping missions from 2006 to last year. The unit’s investigations led to an unprecedented number of misconduct findings by U.N. officials and prompted federal probes into corruption. Ban’s advisers said they blocked Appleton’s appointment on the grounds that female candidates had not been properly considered and said that the final selection should have been made by Ban, not Ahlenius. The above story, as per – www.orf.at/#/stories/2004590/ – also echoed in Vienna. Scheidende UNO-Diplomatin rechnet mit Ban ab. Die scheidende Chefkontrolleurin der Vereinten Nationen geht laut Medienberichten mit Generalsekretär Ban Ki Moon hart ins Gericht. Ban habe ihre Arbeit als oberste Korruptionsbekämpferin unterlaufen und die UNO in eine Ära des Niedergangs geführt, schrieb Inga-Britt Ahlenius laut einem Bericht der „Washington Post“ gestern in einem vertraulichen Memorandum. Entgegen seinen Ankündigungen zum Amtsantritt 2007 habe Ban die durch mehrere Affären angeschlagene Reputation der Vereinten Nationen nicht mit allen Mitteln geschützt. The International Organization for Migration Will Train The Bahamas Police On Matters of Border Control With The Help of the US: An Important Activity In The Light Of the Place of Tourism in the Whole Caribbean Region. IOM ( The International Organization for Migration ) Press Briefing Notes of Tuesday, February 19, 2008. THE BAHAMAS – Strengthening Travel and Identity Document Examination â€“ To complement the government of The Bahamas’ e-Passport, Visa, e-identification and Border control initiative, designed to efficiently manage entry and exit of passenger flows, IOM is hosting a series of workshops for law enforcement officials. Officers from The Bahamas Immigration Department, the Royal Bahamas Police Force, Bahamas Customs and the Royal Bahamas Defense Force will gather today for the first of several training sessions taking place in Nassau, where IOM technical experts will be discussing ways to facilitate legitimate travel while developing the required expertise to identify and deter potential security risks, which might threaten national and regional security. The sessions, basic and advanced (training of trainers) will focus on travel and identity document examination, detection of fraudulent documents, handling and securing evidence and detection of impostors, among other related topics. The trainers will share their knowledge and expertise and provide training to enhance the participants’ ability to detect and prevent the use of fraudulent and counterfeit travel documents and strengthen overall security while facilitating legitimate transit and travel throughout the region. The Bahamas, an archipelagic nation with a total land mass of 5,400 square miles spread out over an area of 100,000 square miles of ocean, faces a daunting challenge with respect to managing migration and securing its borders. The training sessions will be conducted by IOM experts on travel document fraud in collaboration with the U.S. Department of Homeland Security/Customs and Border Protection (DHS/CBP). This IOM project is funded by the U.S. State Department Bureau of Western Hemisphere Affairs (WHA).